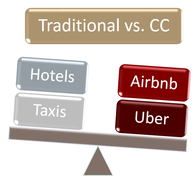 ​FROM A SERVICE-DOMINANT LOGIC PERSPECTIVE"
The overall purpose of this dissertation is to contribute to a better understanding of the collaborative economy (CE). The CE involves direct or mediated peer-to-peer (p2p) resource exchanges, which can occur with or without compensation, and allows for ownership transfers as well as access to goods, services, and experiences. Regarding the CE, this dissertation has two primary objectives. The first is to develop a conceptual typology for collaborative exchanges with the second being to investigate factors associated with the use and evaluation of one broad marketplace within the CE. This dissertation represents an initial attempt to systematically and theoretically explore various elements of the CE. First, this research is grounded in Service-Dominant Logic, which acts as an overarching framework as it helps to explicate the nature of mutually beneficial resource exchange by multiple actors within socially constructed and contextually relevant service networks that are governed by social and cultural norms called “institutions”. Next, an in-depth literature review informs the dimensionality of the collaborative economy in order to provide a means for classifying, describing, and evaluating the CE across three key dimensions. Next, a conceptual model of consumer motivations for participation in one key area of the CE, that being collaborative consumption (CC), will be developed and tested. CC includes p2p service provision or resource exchange, for a fee or some compensation, coordinated by a third party or mediator. One well-known example in this domain, Airbnb, connects consumers looking for lodging with individuals who have accommodations available. As much of this research is exploratory in nature, we follow convention in utilizing a mixed-methods approach, first utilizing qualitative research including open-ended qualitative CIT surveys and semi-structured depth interviews, followed by quantitative survey analysis. Results of this dissertation suggest that there are both social and functional drivers of behavioral intentions relative to CC exchanges. As this new or (re)institutionalized economic model challenges our current understanding of service provision, its continual expansion has significant implications for the future of service delivery. 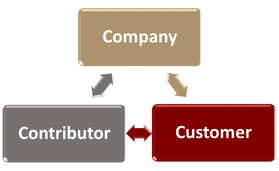 identify various dimensions that can be used to describe the different elements of CC (e.g., access vs. ownership). In addition to an extensive literature review, Essay 1 will rely on depth interviews using the critical incident technique to capture consumers' experiences with CC, which will inform subsequent quantitative survey research. This essay includes two studies designed to contribute to our understanding of factors likely to drive consumers’ participation in CC. Study 1 first identifies how several salient motivational drivers (product/service value, hedonism, CC optimism, and smart shopper orientation) influence consumers’ behavioral intentions (satisfaction and word-of-mouth) regarding participation in CC exchange. In addition, this research explores how brand trust and preference for non-ownership mediate these relationships. Study 2 will look at these drivers across the dimensions proposed in Essay 1. Pilot studies will be undertaken with students and Amazon’s Mechanical Turk labor market (Mturk) will be used to obtain broader data. How expectations regarding service recovery (e.g., Who is expected to recover for a service failure?) may be different in CC vs. more traditional contexts. Whether consumers’ post-failure satisfaction differs depending on whether the firm (e.g., Airbnb) or the service provider (e.g., apartment owner) recovers. The potential benefit(s) of a co-recovery (e.g., participant participates in recovery efforts) in a CC context. This study utilizes a scenario-based, experimental design piloted with students, followed by a data collection utilizing Mturk.